Halloween is a great time of year to talk of monsters. Monsters in movies and scary fireside or bedtime stories, and those roaming our streets in the guise of trick or treaters are commonplace right now. But there are some individuals, like me, who think about monsters year-round. We are students of cryptozoology, the study of creatures that are possibly real but certainly alive in legend and lore. In the more rural parts of New England, residents have reported sightings of unexplained beasts that inhabit the night, dawn, dusk, and sometimes, most frighteningly of all, the daylight. 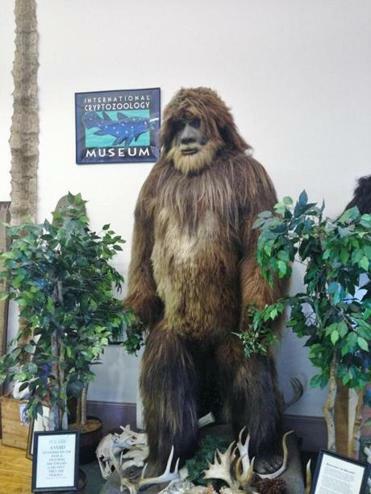 Here’s a guide to some of the more famous creatures of the region we have catalogued at the International Cryptozoology Museum in Portland, Maine. A bright orange, 4-foot-tall creature was spotted during one week in April 1977 by four people, first at a stone wall along Farm Street and two other times in the next 25 hours. One eyewitness, Bill Bartlett, reported seeing the creature bathed in the high beams of his Volkswagen. Bartlett said the creature grabbed a rock with long fingers, slowly turned its head toward the approaching car, and stared into the light. He realized it wasn’t a dog or cat. The entity possessed a large head shaped like a watermelon. In an interview Bartlett told me that in the center of the head glowed two large, round, glassy, lidless eyes, shining brightly “like two orange marbles” in the headlights. There was no discernible nose, mouth, or ears. The head seemed supported on a thin neck. The creature’s body, according to Bartlett, was thin with long spindly arms and legs and large hands and feet. The shape reminded him of a “baby’s body with long arms and legs.” Its skin was hairless and appeared to be the rough texture of a shark. Then it vanished into history. Bartlett later made a drawing of the creature atop a stone wall. John Baxter, an eyewitness at the second sighting, sketched the demon leaning against a tree. These upright hairy creatures, humanlike in shape, have been commonly referred to as Sasquatches or Bigfoots. The region’s Algonquin tribes knew these creatures of the forests as Windigo. There have been sightings in a number of rural parts of the country. Here they have been seen in the Berkshires, Hockomock Swamp, and other swampy and wooded areas of Massachusetts and mountainous areas of Vermont, New Hampshire, and Maine. If you are looking for one special place to search for Bigfoot in New England, head to October Mountain in the Berkshires. The mountain, near Lee, is in a state park encompassing 16,500 acres of some of the wildest, most natural land in the state. It seems the natural habitat for a band of Bigfoot, and indeed sightings have been recorded there for more than a century. Seventeenth-century Massachusetts colonists wrote about the sea serpents they saw from ship and shore. There were reports along the coast from northern Maine to Massachusetts and southern New England. Whether called “Cassie, the Casco Bay Sea Serpent” around Portland or the “Gloucester Sea Serpent” in the Bay State, sightings of a giant serpentine creature have emerged regularly over the centuries to the present day. Perhaps the best-known sightings occurred off Cape Ann and Gloucester in 1817-19. The August 1817 accounts were so numerous that General David Humphreys, a former member of George Washington’s staff, gathered the sightings and published them in the Linnean Society of New England’s report of 1817. He noted that the head, visible above the water’s surface, was described as being “much like the head of a turtle” but as broad as a horse’s with foot-long horns on top. The body was said to be 80-100 feet in length, like a “row of casks” or like a “string of buoys on a net.” Over a period of two years, hundreds claimed to have seen the serpent. Since then, others have reported seeing similar sea creatures, even as recently as this past August off Mount Desert Island, Maine. There have been numerous reported sightings of the giant condor-like birds of Native American lore. One of the most dramatic incidents occurred at 2 a.m. on a late summer’s night in 1971. Norton police sergeant Thomas Downy was driving along Winter Street in Mansfield, toward his home in Easton. As he approached a place known as Bird Hill in Easton at the edge of the Hockomock Swamp, he was confronted by a tremendous winged creature over 6 feet tall with a wingspan of 8 to 12 feet. When I interviewed him, Downy told me that as he drew to a stop at the intersection, the bird flew straight up and disappeared over the dark trees into the swamp. Downy reported the sighting to the Easton police. A patrol car searched the area but found nothing. For weeks after, fellow officers dubbed him “The Birdman,” but Downy stuck to his story. One of the most famous mystery cats in modern Massachusetts history is the “Beast of Truro.” In September 1981, an unidentified predator began killing pets and livestock. First domestic cats were attacked, killed, and mutilated. One eyewitness later was quoted in The New York Times as saying that the killer had a long, ropelike, curved J-shaped tail, and weighed upward of 80 pounds with short ears. Others said the predator looked like a cougar. A New Yorker visiting Truro in December 1981 reported to town officials that he’d seen a mountain lion. All are names for the same kind of animal, of course. But wildlife officials have said they believe mountain lions to be extinct in the East. In January 1982, a mystery predator, thought to possibly be the Beast of Truro, mauled penned pigs in two incidents. And then the attacks stopped. In the 1940s and 1950s, there were reports of a “lake monster” — said to be a “Giant Frog” or little “Frogman” — in Plymouth County’s Silver Lake that were talked about around general stores and mentioned in passing in old newpaper articles. Years later, wildlife officials were on the lookout for an alligator that was rumored to have taken up residence in a same-named but different Massachusetts pond. Department of Conservation and Recreation officials searched Silver Lake in the Breakheart Reservation Park in Saugus on July 28, 2011, after two alligators sightings. No alligators were found. From the 1890s to the 1930s, reports arose in areas around Bangor of a large moose of upward of 2,500 pounds and 15 feet tall, with 10-foot antler spreads and dusky white in color. Hunters have gone in search of the so-called giant Specter Moose (because of its coloring), with reports of sightings of one or more beasts around Lobster Lake, but no one has brought home the white trophy moose. In 1917, New York hunter J.G. 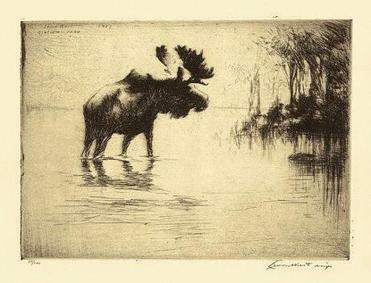 Sullivan reported seeing a giant white bull moose near Mount Katahdin, an incident noted in The Evening Post of New Zealand. Sightings continue periodically today along the coast of Maine. And, in an interview, journalist Ric Oliveira and his wife reported seeing a giant moose in Southeastern Massachusetts in 1999. 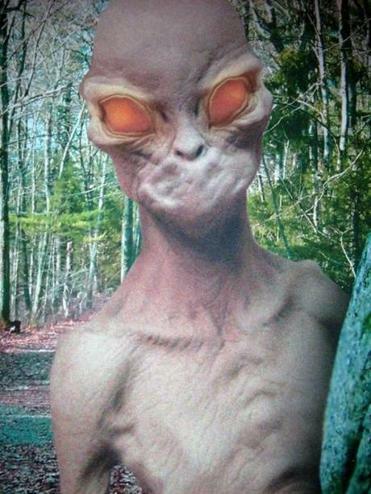 In the 1970s, I defined a specific area of spookiness and strangeness in Massachusetts, which became known by cryptozoologists as the Bridgewater Triangle. Abington, Freetown, and Rehoboth form the corners of the triangle, and the area has been the locus of reports of many bizarre creatures, perhaps none as weird as the Pukwudgees. The word Pukwudgee is a Delaware and Wampanoag word that means “little wild man of the forest.” The creatures were a part of Native American traditions and are said to be dwarf-like hominids with gray skin and large ears, fingers, and noses. All manner of magical powers, abilities, and traits are associated with them, including behaviors such as disappearing and shape shifting. Some have said they possess poison arrows and are able to start fires. Look behind you: According to lore, the little beings will shove people off Assonet Ledge in the Freetown State Forest if given the chance. Several other creatures that occur repeatedly in human folklore and legend have manifested themselves in the Bridgewater Triangle, including huge mystery snakes. As one police officer told Brockton newspaper reporters in 1970 about strange happenings in the area: “Nothing surprises us much anymore. Last week, a motorist ran over an eight-foot boa constrictor. We still haven’t learned where that came from.” In 1939, Civilian Conservation Corps workers, completing a project on King Philip’s Street on the edge of the swamp, reported in Depression-era news items of seeing a huge snake “as large around and black as a stove-pipe.” The snake coiled for a moment, raised its spade-like head, and disappeared into the swamp. Local legends claim that a huge snake like this one appears every seven years.